Join the discussion on our forums! 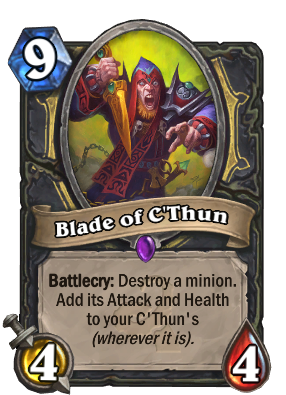 Come discuss Blade of C'Thun over in our dedicated Blade of C'Thun discussion topic. Too bad I never opened theese cards, i would love to play C`thun Rogue the way Kripp played it... Play a regular Tempo/Miracle Rgue but adding C'Thun and this card to just bounce it and get a ton of value. Maybe I`ll try it if I start playing wild if I get bored of Standard and I have a lot of dust to spare. Imagine this guy with Shadowcaster. Creepy. And then you can use it along Brann Bronzebeard for double the buffing. Absolutely love this card. I play C'Thun / N'Zoth Rogue for most of my 80g quests, it's so much fun. Some peole just run a three card c'thun package, but I have been running 6: two of this, 2 Disciple of C'Thun, C'Thun, and Twin Emperor. nothing more satisfying than playing N'zoth and bringing back 3 or 4 decent minions before playing a single C'Thun card and then using Blade of C'Thun out of nowhere. It rarely gets old. I was just playing evolve shaman against Dragon Priest and we get on a Topdeck war. I have board control until he playes Deathwing, so I topdeck devolve, think "Even like this he'll probably get Ysera, Nefarian or something" but play it anyway and he gets this card. I manage to win that game. Pretty Good card imo. It's pretty much an Assassinate + a 4/4 body, which is about right for 9 mana, considering assassinate is 5. The addition of stats to your C'thun is just the icing on the cake. I wouldn't call it the "icing", considering this card makes C'thun Rogue viable in 3 cards. When you can play two of these guys and get a C'thun with 15+ attack easily without ANY other C'thun cards, I think it's a little more than icing. lol. My favorite card in hearthstone, The reason i play Rogue and C'Thun. This card has been mvp so many times it isn't funny. Brann Bronzebeard lets him buff C'Thun twice. Many, many games I can coin him out early, then use Shadowstep or Shadowcaster for more value. Yeah, Brann combo is so sweet. It can be pulled on the same turn with Shadowstep. Killing 7/7 this way equals +14/14 to C'Thun, not to mention he needs to remove Brann now (else C'thun will just put everything down to 0). The design of this card is genius. Buffing your C'thun via assassination is a perfect fit for Rogue. The design of this card is genius. Buffing your C'thun via assassination is perfect for Rogues. I wanna craft it just for that reason alone. Unless you play Reno Jackson! Works great!